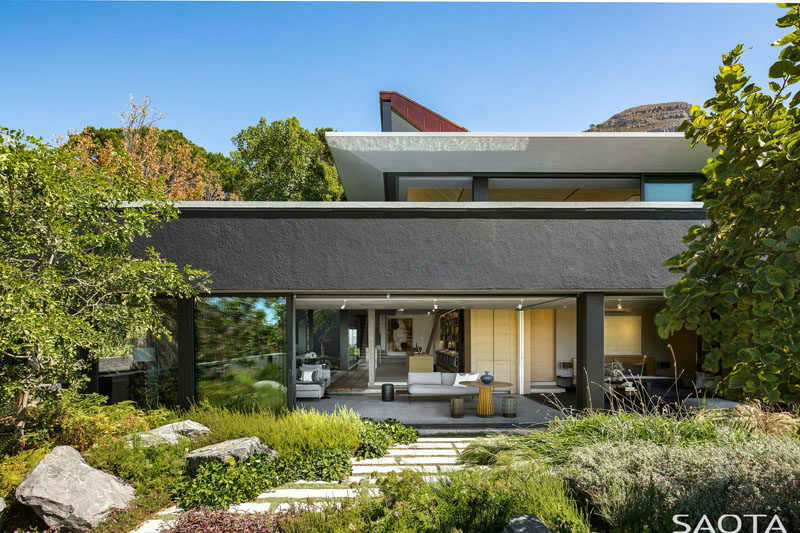 The house has been designed with an inverted pyramid roof, which creates a clerestory window around the upper level, increasing the views of the mountains, while bringing the sun and moonlight into the home. 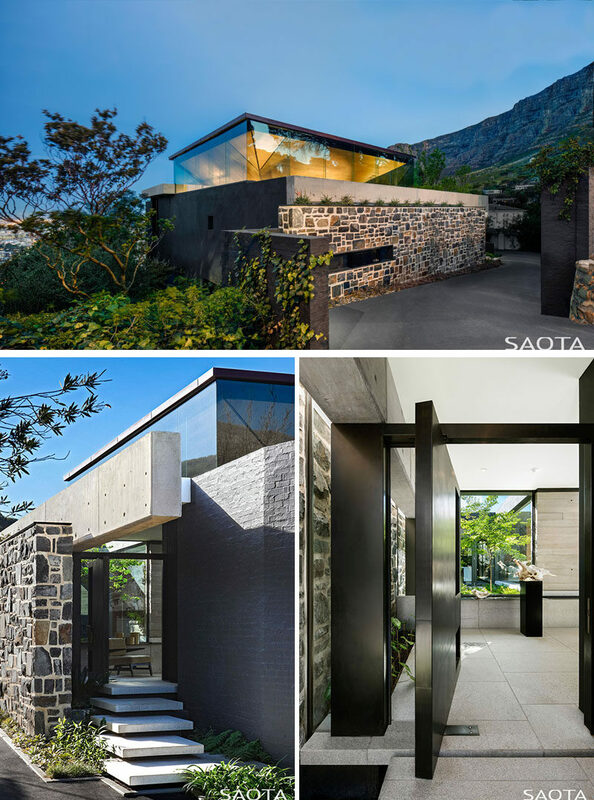 A stone wall, built in a traditional Cape way, provides privacy from the street and guides visitors to the large metal pivoting front door. The front door opens to a small entrance lobby connected to a courtyard garden. 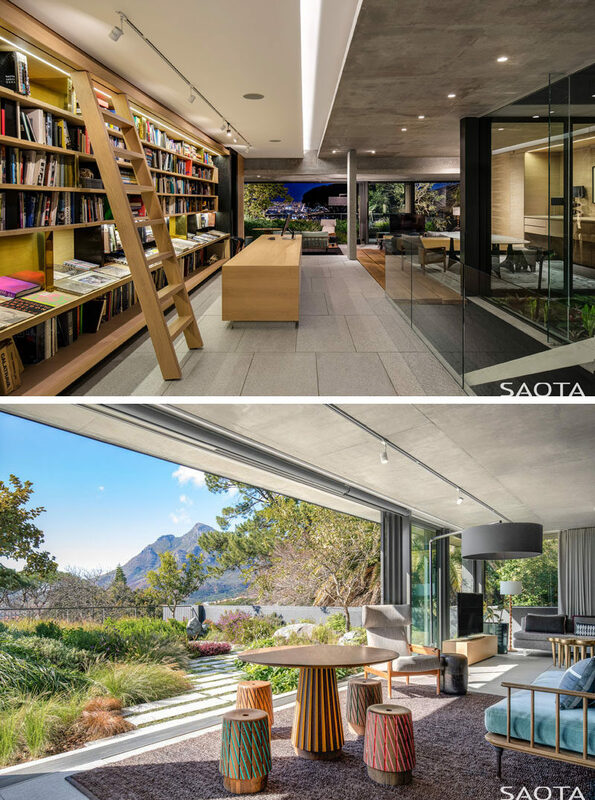 A few steps take you up into the living space with views over the city. 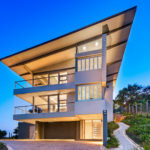 The house is split up into three levels, with the top level home to the main social areas of the house. 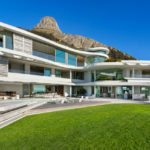 The living room has large sliding glass walls that connect the interior to the garden, the swimming pool, and the outdoor decks. 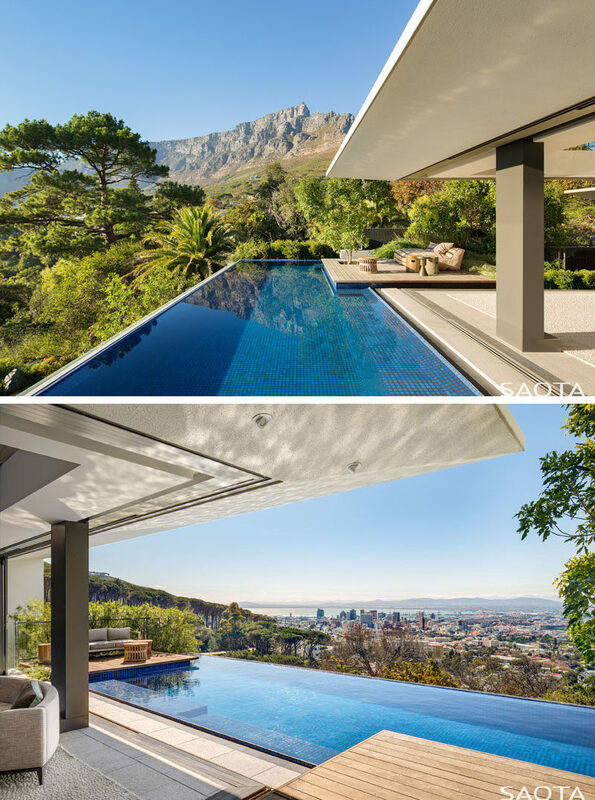 The swimming pool provides views of the mountains from one angle, and from the other, views of the city of Cape Town. Back inside, and from this view, you can see the mountains through the windows that surround the inverted pyramid roof. The dining room has been defined with the use of a large rug, and a minimalist pendant light above the table. 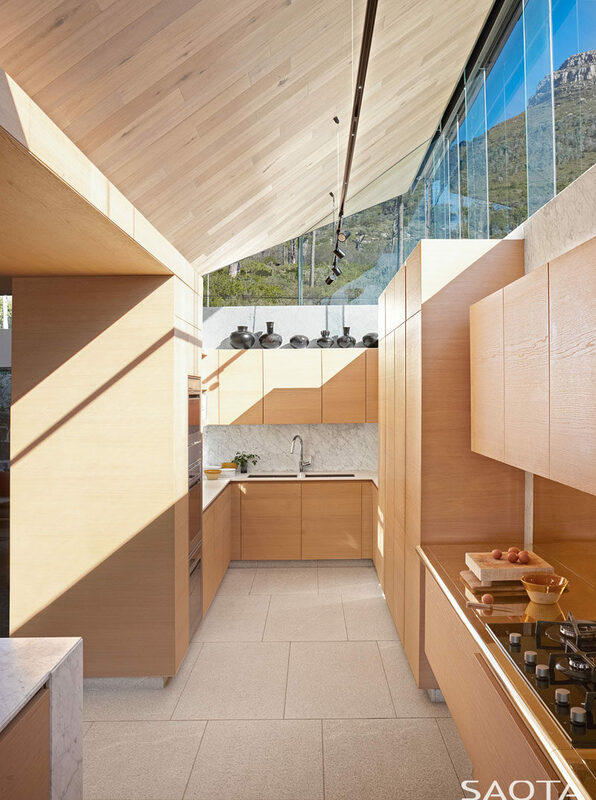 Also on this level of the home, is the kitchen that features light colored wood cabinetry, while the windows provide natural light and even more views. 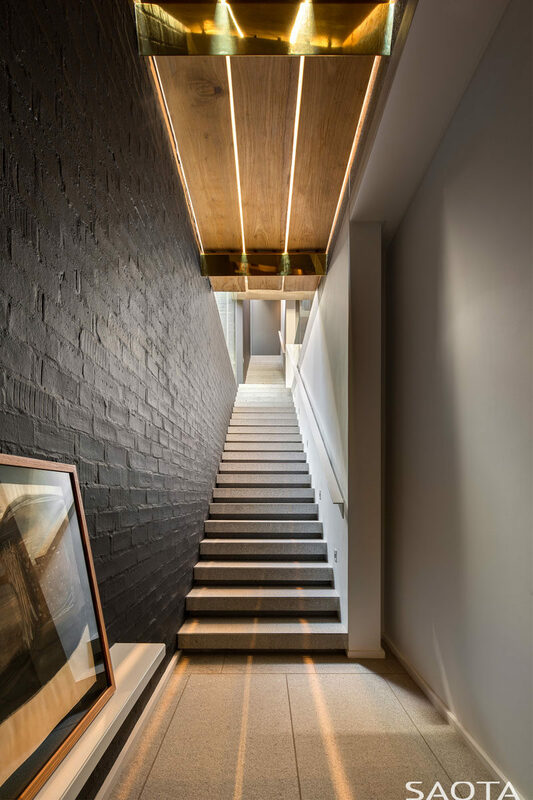 A dark accent wall sits beside the stairs that leads down to the middle level, that’s home to a courtyard and garden, the bedrooms, bathrooms, a library and a lounge. In the library, a bookshelf runs floor-to-ceiling and wall-to-wall, and a rolling library ladder is available for reaching the high shelves. At the end of the library, there’s a lounge that opens to a landscaped garden. Here’s a look at one of the bathrooms. 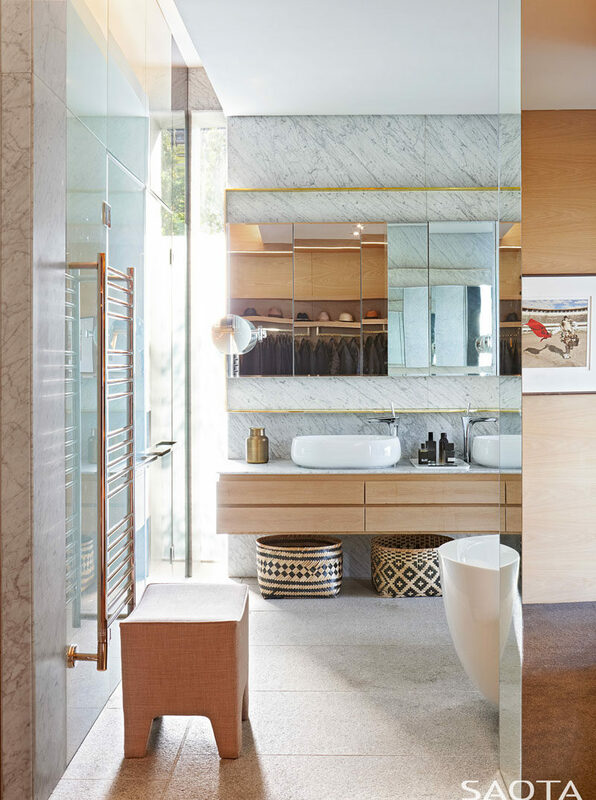 that features gold accents, stone, glass, wood and a white sinks that complement the white freestanding bathtub. Another staircase leads down to the garage, gym, laundry, and staff quarters.